If you think of prominent watch brands that have made marks in the watch history, you’ll probably hear Hamilton. The company invented the first digital wristwatch and first battery-operated one, so you could say they have been around for a very long time. To purchase a timepiece with great heritage has been one of my goals for so long, considering the watch aficionado that I am. With the kind of history Hamilton has, I am convinced to look, and probably purchase, at their masterpieces. 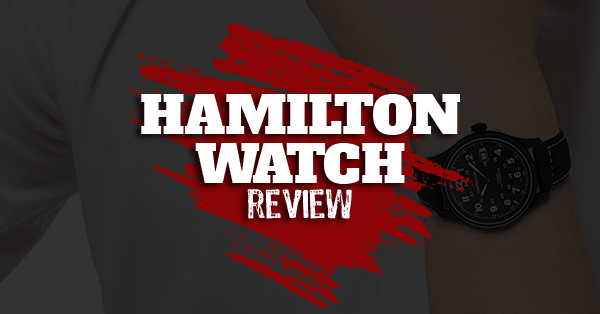 In this Hamilton watch review, allow me to share my top picks below. What makes a Hamilton outstanding? First to be featured on our list is the Khaki King II. You’ll feel like a king (or queen) while wearing this timepiece with its luxurious look and outstanding features. Its stainless steel case and bracelet with black dial will justify its elegance. Located in the black dial are its luminous hands and hour markers that are sure to give you an easy reading. The Khaki King II is more than just an elegant timepiece with its highly durable scratch-resistant sapphire crystal and water resistant to 50 meters. Powered by a Hamilton Calibre H-40 that makes use of 25 jewels into the design, Khaki King’s rotor now has an H-shaped cut-out in the center. This makes its movement look more modern and chic. I think this is what makes a Khaki King II very lovable. It’s the timepiece’s design that will surely bring a nice touch to your personal collection. Designed for the outdoorsy and adventurous type of person, the H70455733 has a very rugged and robust look. With its sapphire crystal which makes it scratch-resistant and stainless steel case with a leather bracelet, this watch is sure to end up on your wrist anywhere you go. Moreover, the H70455733 can proudly withstand the waters as it’s suitable for swimming and snorkeling with its water resistance to 100 meters. The H70455733 doesn’t give its users a hard time reading the date and time with its luminous hands and Arabic numeral hour markers on a contrasting black dial. Minute markers can also be found outside, on the watch’s rim and a date display is also showcased at the 3 o’clock mark. To make things more accurate, the H70455733 runs on a Swiss self-winding automatic movement. 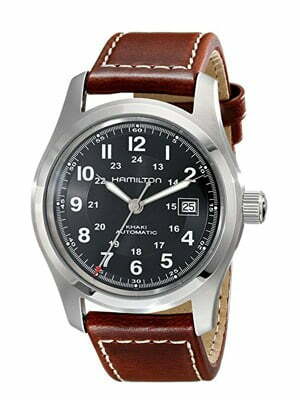 Included in this Hamilton timepiece evaluation is the Hamilton H69419933. This silver-toned watch features a round dial with 12 and 24-hour display paired with luminous hands. Its stainless steel case is combined with an anti-reflective sapphire window which makes it highly scratch resistant. Completed with tonal topstitching on its band and buckle closure, the H69419933 is safe to take on your light outdoor activities. It’s resistant only to 50 meters, so the watch is limited only to recreational swimming. The H69419933 runs on a hand-wound mechanical movement which is powered by winding the mainspring within the movement which is usually done using the crown. This means an absence of a rotor, therefore making the watch relatively thinner. Knowing this fact, the watch is perfect to wear on special occasions and events because of its attractive and timely design. 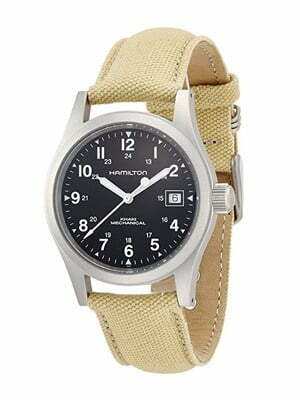 In line with the Khaki Field watches, the H70555533 is also a stunner with its combination of chic design and heavy-duty functions. Conquering mountains and living the outdoor life will be a breeze with this watch. Specifically engineered to withstand the tough life in the field, the H70555533 has a scratch-resistant sapphire crystal window, a steel crown, and a leather band. Its luminous hands and Arabic hour markers on a black dial gives you easy timekeeping. It also has a date window at the 3 o’clock mark, just like any Khaki Field watch. The best thing about this watch, in my opinion, is its exclusive H-10 automatic caliber. What this does is it keeps up to 80 hours of power reserve which is especially helpful when you’re out camping in the woods, or trekking through the forest. The H70555533 is made to meet your needs. 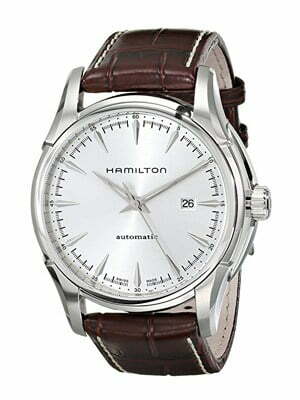 Last but certainly not the least on our list is the Hamilton H32715551 Jazzmaster Viewmatic. At first glance, this watch will give you a very classy vibe with its stainless steel case and brown leather strap. Its appearance screams elegance with its sapphire crystal screw-in caseback, with silver-toned dial and indices plus luminous silver hands inside. Just like the previous watches, it also has a date window at the 3 o’clock position. Don’t be fooled by its classic appearance as it is tough with its features. The H32715551 is water-resistant to 100 meters and also runs on a Swiss automatic movement. Boasting its caliber 2824-2, the H32715551 can have a power reserve up to 40 hours. So, you’re probably wondering why it has “Viewmatic” in its name. The H32715551 has an interesting feature that lets you see-through its case back. This lets you have an in-depth view of its automatic movement happening at the back. This watch, like many of the best automatic watches out there, has both a striking front and back view. Elegance and functionality at its finest - this piece can't be missing in any of my watch reviews. A Hamilton timepiece review would not be complete without knowing its humble beginning and how its brilliance started. The watch brand was made official in 1892 and made its first watch in 1893. The company occupied the Lancaster factory which was former homes to three other watch companies. Unlike the previous brands that operated in the factory, Hamilton succeeded. The public admired their watches’ accuracy and fine mechanisms. Moreover, Hamilton cleverly marketed their business to the newest American industries, which made a hugely positive outcome to the brand’s name. Eventually, the company became associated with the US railroads. This greatly made people attached to their service. At the time, there was no standard for timekeeping and accidents were prominent because of the difference between conductor’s pocket watches. This is where Hamilton changed the game, claiming 56% of the railroad community using their watches to get to where they should be on time safely. This made Hamilton release the Railroad Pocket Watch in 1912, making their ties to America’s largest transportation system even stronger. In 1914, the company then made its way to America’s armed forces. Later on, American soldiers noticed a new trend when they arrived in France in 1917. Some watch companies strapped pocket watches to user’s wrist so soldiers could do their job better, and Hamilton took note. Lo and behold, the 981 Wrist Watch was made. Hamilton accompanied pilots on their first ever airmail delivery. This was in 1918 during the interwar years. Soon after, the company became linked to more dangerous and extreme form of exploration. 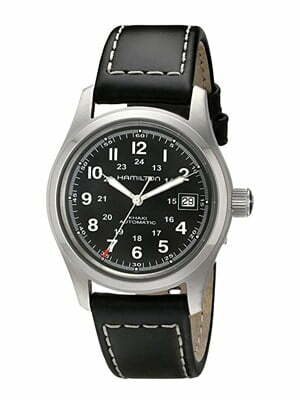 The need for accuracy on land, air, and sea meant Hamilton watches witnessed action all throughout World War II. 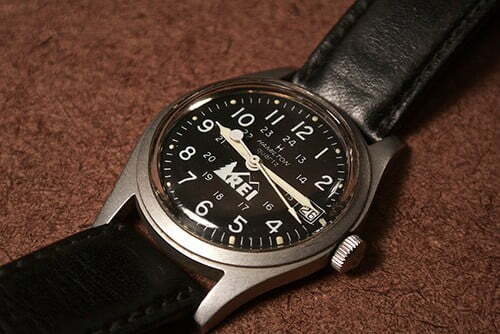 By 1942, the company decided to focus solely on time-pieces for America’s armed services. However, despite this, Hamilton was still considered to be the best when it comes to serving technological war equipment. In 1943, the US Army and Navy honored Hamilton with the “E” Award for excellence. 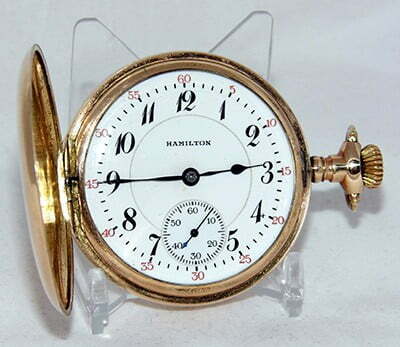 Fast forwarding to 1957, Hamilton made Ventura, the world’s first battery-powered watch. Adding to its fame is its appearance on the 1961 film Blue Hawaii, where Elvis Presley personally picked a Hamilton chronometer in this film. By 1960s, things for Hamilton became disruptive. However, in 1966, Hamilton acquired Buren Watch Company of Switzerland, and with it, their micro-rotor. This made way for the production of slimmer timepieces. Also in that same year, Hamilton designed futuristic watches for the film 2001: A Space Odyssey. Later that decade, the Lancaster factory closed. Hamilton left the US market in 1969, working for a few years with Buren in Switzerland before the company was bought a company now known as the Swatch Group. For over six decades, Hamilton’s timepieces have made an appearance in more than 450 Hollywood movies, which made it the movie brand. If it’s not obvious enough, Hamilton produces the finest and most accurate timepieces. 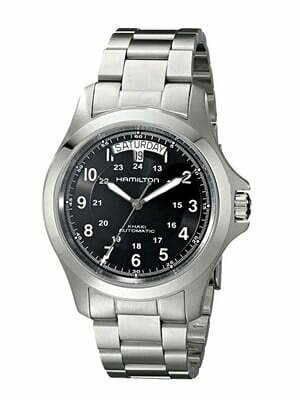 Hamilton watches have distinct features and characteristics that make it stand out from the rest in most watch reviews. Hamilton watches do not only have its strong heritage to boast, but it also has its Swiss ETA automatic movements, thanks to their association with the Swatch Group. These high-quality timepieces will earn your respect accuracy and durability, just like military-grade watches. Producing the very first battery-operated wristwatch, and a digital wristwatch in 1970, the company is still enhancing its craft and is determined to be the front-runner of watch technology.